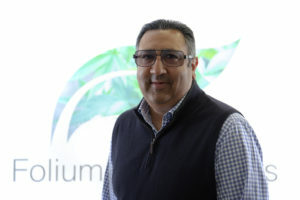 Kashif Shan, CEO and founder of Folium Biosciences, the largest vertically integrated producer, manufacturer and distributor of hemp-derived phytocannabinoinds, is this week’s guest on the Green Rush! With the passage of the Farm Bill in 2018, hemp and CBD is now 100% legal so Anne and Lewis sat down with Kashif to get an overview of the current state of the CBD space, the future growth market for hemp derived CBD and when we may see big box retailers take a bigger step into the CBD marketplace. In addition to touching on the overall industry, Kashif provides our listeners an in-depth look at the inception and growth of Folium Biosciences, how the company plans to use the funds it received from a recent investment by Australis Capital, what Folium’s R&D department is working on right now and the story of how Kashif let his conservative parents know he was working in the cannabis industry. This week’s conversation is sure to be a treat for those who are interested in learning more about the CBD space. So sit back and enjoy! Kashif Shan is the Founder and CEO of Folium Biosciences. Kashif has spent over 20 years as a High Technology Executive across a range of fields where he oversaw Finance, Facilities, and HR. Kashif founded Folium Biosciences in 2014 and has helped grow the company to become the global leader in non-psychoactive cannabinoids and employs over 250 people. Prior to entering the cannabis space, Kashif was the Founder of Equus Capital, a real estate investment company. This episode was hosted by Lewis Goldberg and Anne Donohoe of KCSA Strategic Communications.